I opened up my front door to the check the mail today and I was smacked in the face by the distinct scent of spring. 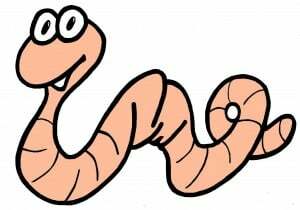 It was exactly like a worm had crawled up each of my nostrils. You know that worm smell? It was right up there in my nose. Which can only mean one thing … that other icky season is over … bring on the spring! A new season means NEW ACCESSORIES FOR THE HOUSE!! YAAAAYYYYYY. O.K., I’m not exactly that enthused about it, but I thought it would add a greater sense of excitement to the post. 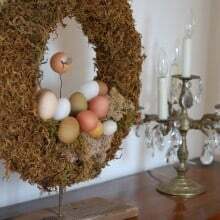 The problem is, Easter is then next logical holiday to decorate for and – no offence to those of you who love it – I can’t stand Easter. I haven’t been able to eat ham since dissecting a fetal pig in biology class, I’m not a huge fan of chocolate, and I think the decorations are often hideous. 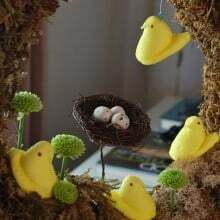 Easter decorations are like kids toys – they’re necessary … but WOW they can be ugly. Coloured plastic grass in pink, pale yellow, and all those other colours that should only be seen in a sherbert cup, does not enhance any decor. And if you’re one of those people who owns a stuffed bunny dressed as a farmer, holding a “Have a Hoppy Easter”, sign I am automatically a better person than you. Even if I do have one of those in my basement. At least it’s where it should be. 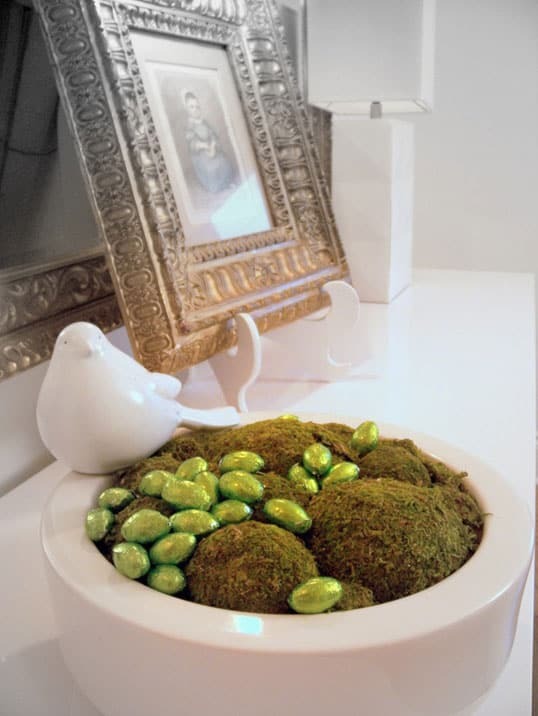 Decorating for Easter or Spring doesn’t have to be tacky and gross. Think tulips, moss, and birds and play around with those things. 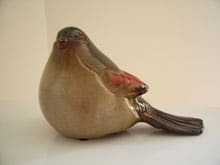 I also love the plastic rabbits that look like chocolate bunnies I’ve been seeing in Homesense the past couple of Easters. The cheapest thing you can do to make a house look Easteryish (yeah, it’s a word … I looked it up) Stick a handful of gold or silver chocolate Easter eggs in dishes or antique tea cups around the house and you instantly have Easter decorations that don’t scream “MADE IN A PROSPERING ASIAN COUNTRY FOR THE STUPID, TASTELESS PEOPLE IN THE WESTERN COUNTRY”. Speaking of things made in Asia for people with no taste, I went to Dollarama today. 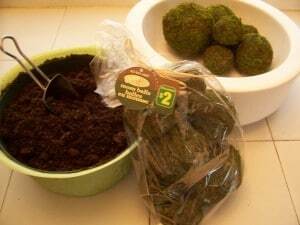 I picked up a bag off moss balls for $2.00 to make my own Easter/Spring decorations. It is at this point that I should confess I wasn’t even going to publish this post because the pictures turned out so ugly. 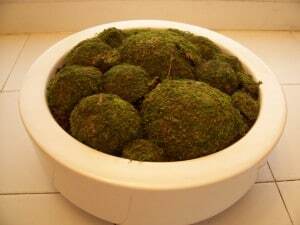 Trust me when I tell you, the bowl of moss looks MUCH better in real life. I’m really going to have to take a photography course or something. More stuff to learn! 1. Gather your stuff and get ready to commence. 2. 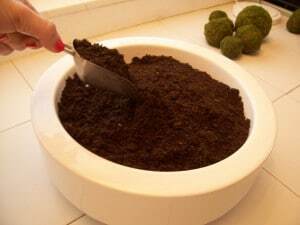 Fill your bowl of choice with dirt. Make sure it comes right up to the very top of the container. 3. Cut your balls with a bread knife. Cut some in half, and just the ends off some so you have different sized pieces. 4. 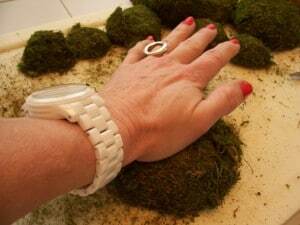 Squash down some of the balls with the palm of your hand so they become a bit irregular in shape. 6. It’s done and you can either stick the bowl on a table or sideboard or night table or hall table or any table really, as is. Or …. 7. Wanna go more festive?? A little more Easter as opposed to spring? 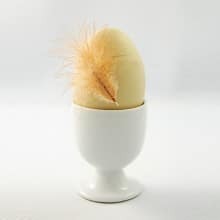 Stick a few foil eggs in it, maybe a bird …. and Bob’s your Uncle. I hate that worm smell! Yuck! We don’t have that yet there is still a bunch of snow on the ground 🙁 Oh well! 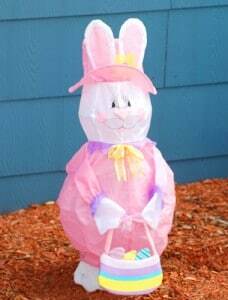 I don’t like Easter so much either but that is a good decorating idea! I love your commentary on Easter! I found it highly entertaining. shannon- Thanks for the comment! I’m disgusted with my pathetic photography, but I’m glad at least the writing portion of the post could entertain you! And your quote is dead on. Kind of like .. if we didn’t work all week, the weekend would not be so pleasant! o0o0! I strongly disagree. The weekend is just as good during the summer when you’re not at university working alll week. Karen, I think you’re being too hard on yourself about these photos! 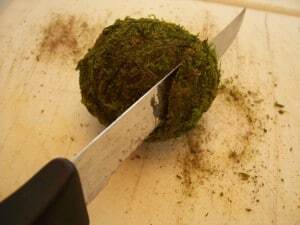 While I am sure you can improve your photographic skills, the adorableness of these moss ball creations is still evident. Totally agree! Easter is the WORST holiday in the “seasonal department” at the stores!!!!! I laughed out loud when I read the first few lines, because I knew where you were going with this one! I love your ideas, especially your thought process. Best wishes. Thanks A. If you like that post (which is a billion years old and one of my first) you’ll love the newer ones. 🙂 ~ karen!